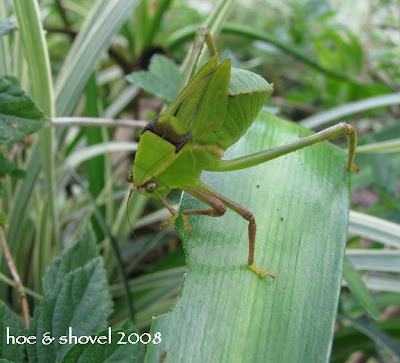 Hoe and Shovel: Alien or Grasshopper? What do you suppose this guy had been up to? And absolutely no shame. What nice chewing patterns you have. Maybe you are too full to move. Today as I was pruning the lantana in this container I noticed this "BIG GREEN BUG"on this Amaryllis leaf. It kind of startled me when I realized I had been all around and practically on top of it before I even saw it - I guess because it sat there still and staring at me... AND afterall its disguise of a lovely shade of the same green creates an effective camouflage. Have a look at those eyes- and stubby wings- and legs of different lengths- and bulbous body! Last year the giant yellowish- greenish spotty grasshoppers ate nearly every Amaryllis plant in the garden. I don't remember seeing the beginnings of them until late March and they didn't look like this. This is a very different type from last year. I've never actually seen this kind of grasshopper. Anyone have any idea about this guy? Although I have to admit this particular guy didn't live to tell about his good meal... nor to eat any more of my Amaryllis. I'm sure he has cousins close by which I will now be on the lookout for with a new awareness. I wondered where my pet mutated grasshopper had gone:) He's real expensive....you didn't squash him did you. I need him back! I'm afraid of praying mantis. I think they are human. Their eyes follow you around and I'm afraid it will take a big hunk out of me. I think they are called praying mantis so you pray to stay alive. Anna- Now I think praying mantis are cute AND they don't eat my greenery! This guy DOES look like a mutant doesn't he? Alien! That's my vote. Sorry you had to find this in your garden but better you than me. For a gardener I'm pretty squimish about bugs. I believe that is a katydid. I haven't seen one that fat though. Those eyes mean business, don't they! I have not help for you in identifying him - just wanted to say, "what a cool picture!" My first thought was katydid, as well. But he does look a bit 'different'. Maybe the angle? Try posting at Bug Guide Same with your little bug the other day. He looks like a grasshopper, but could be a nymph of something else. There are so many insects... I'm in awe of people who can readily ID so many. nancy: I think this is a completely different one from last year just because they look so different from the other but then again I'm no expert. Hey- thanks for stopping by hoe and shovel. melanie: I know what you mean. 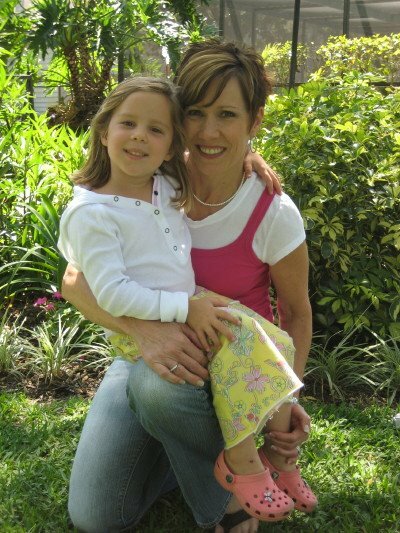 In my younger years I was a bit squimish about anything that crawled, slithered or hopped in my garden. Somehow I've gotten very used to all of it now and not much bothers me- even snakes which is a real surprise to myself. Thanks so much for stopping by and leaving a comment. Robin: I'm thinking you might be onto something... Although I've never seen a katydid in my garden or in my area. I looked up some images of katydids and this does guy looks very similar. I read there are over 4000 species of katydids. wow. Mary Beth: It was the eyes that got me! LOL I always have to snag a picture of the bugs in my garden. I don't know - it just intriques me so. Since I decided I love my camera I take special notice of every critter. Sophie: now that you mention it I'm thinking the little guy from the other day might be a nymph from this big one??? Thanks for the reminder of bug guide... I'll check it out. EEk! Run away! Run away! I don't think I'd want to see this critter in MY garden, although the regulars around here don't phase me a bit. I hope you figure out what it is, because I'm curious too! Someone send for help. Meems hasn't posted back since she was last with the critter!! Wonder what the critter thought when it ate Meems? Did it morph again? If so--it's a new species and I get to name it Meemhopper. Or maybe Katymeem. jodi: It was very still and didn't move much even with my lens dangerously close to its buggy eyes. I kind of hope I don't see anymore of them... we have enough critters devouring foliage without new breeds. Anna: Don't worry about Meems... I managed to get away from the mutant katyhopper. Thanks for checking... AND making me laugh. The grasshopper from last year is one of our beloved Florida natives, the Lubber. I've never seen them outside the trails though. You should be honored that they chose to live in your garden!